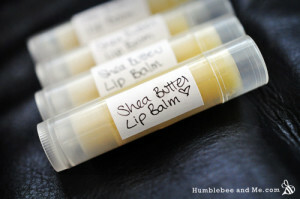 Marie of Humblebee and Me created this recipe for a moisturizing Shea butter lip balm. It’s a wonderful mixture of Shea butter, cocoa butter, avocado oil, beeswax, cardamom essential oil, and a few other ingredients. Click on the Intensely Moisturizing Shea Butter Lip Balm Recipe link below to see Marie’s recipe.